The landing site of China's Chang'e-4 lunar probe has been named "Statio Tianhe" after the spacecraft made the first-ever soft landing on the far side of the moon last month. Together with three nearby impact craters and one hill, the name was approved by the International Astronomical Union (IAU), Liu Jizhong, director of the China Lunar Exploration and Space Engineering Center of the China National Space Administration (CNSA), said at a joint press conference. The CNSA held the joint press conference with the Chinese Academy of Sciences and the IAU. "Tianhe" is the Chinese word for Milky Way and "Statio" is Latin for base. Before "Statio Tianhe," only one place is listed on lunar maps as "Statio," namely "Statio Tranquilitatis" (Tranquility Base), the site the Apollo 11 crew members of the United States landed and walked on in 1969. According to the CNSA, the Chang'e-4 probe landed at the preselected landing area at 177.6 degrees east longitude and 45.5 degrees south latitude on the far side of the moon at 10:26 a.m. Jan. 3 Beijing Time. The landing area is the Von Karman Crater within the Aitken Basin. The three nearby impact craters located in the Von Karman Crater form the shape of a triangle with Statio Tianhe at the center, looking like the celestial Summer Triangle prominent in evening skies from June through December in the northern hemisphere. The defining vertices of the Summer Triangle are at Vega, Altair and Deneb, each of which is the brightest star of its constellation. The three craters were therefore named after the three stars with names in traditional Chinese astrology. Zhinyu is for Vega, Hegu (also called Niulang) for Altair and Tianjin for Deneb. In Chinese folk tales, lovers Niulang and Zhinyu, one a cowherder and the other a weaver fairy, were separated by the Tianhe (Heavenly River, or the Milky Way), as their love was not allowed by the gods. They could only reunite once a year when a flock of magpies formed a bridge across the river. In Chinese, Tianjin means galaxy's ferry and bridge across the Milky Way. Along with relay satellite Queqiao (Magpie Bridge), the naming of Statio Tianhe and the three craters are integrated with rich cultural connotations, said Li Chunlai, deputy director of the National Astronomical Observatories of China and commander-in-chief of the ground application system of Chang'e-4, at the press conference. At the center of Von Karman Crater, around 46 km northwest to Statio Tianhe, a hill that was used to locate the landing site was named Mons Tai. Regarded as the foremost of the Five Great Mountains of China, Mount Tai is of historical and cultural significance. Mons is Latin for mountain. It is the IAU's first time approving lunar place names with "Mons" since 1985. The IAU is the officially recognized authority in astronomy for assigning designations to celestial bodies such as stars, planets and minor planets, including any surface features on them. Liu said naming lunar surface features provides scientists in China and abroad with original data and location standards and will open a new chapter in lunar exploration in the world. In January 2016, the landing site of Chang'e-3 was named "Guang Han Gong" or "Moon Palace," more than two years after the probe made China's first successful soft-landing on the moon in December 2013. The Chang'e-4 probe, launched from the Xichang Satellite Launch Center in southwest China on Dec. 8, 2018, touched down on the far side of the moon after orbiting the moon for more than 20 days. 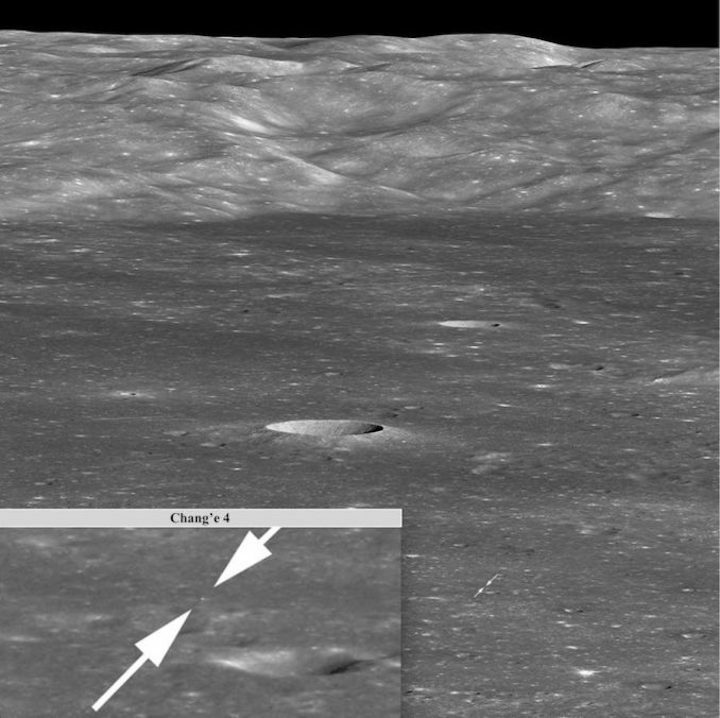 With the communication assistance of the relay satellite Queqiao (Magpie Bridge), the probe sent back the first-ever close-up photograph of the moon's far side. The United States space agency NASA said Friday that its lunar orbiter has observed the landing site of China's Chang'e-4 lunar probe for the third time, capturing a much sharper view. NASA's Lunar Reconnaissance Orbiter (LRO) passed nearly overhead the Chang'e-4 landing site on Feb. 1, giving a 0.85-meter per pixel picture of the lander and Yutu-2 rover or Jade Rabbit-2 from an attitude of 82 kilometers, according to NASA. This view had close to the smallest pixel size possible in the current LRO orbit. NASA said the rover was 29 meters northwest of the lander, but the rover had likely moved since the image was acquired. According to NASA, the LRO will continue to image the site as the lighting changes and the rover roves. On Jan. 30 and Jan. 31, the LRO snapped the landing site for the first and second time respectively, but both in a slant angle, according to NASA. Chang'e-4 set down on a relatively small farside mare basalt deposit. NASA hoped that China's probe could find out the composition of farside basalts with its visible near infrared spectrometer. NASA’s Lunar Reconnaissance Orbiter has spotted China’s Chang’e 4 lander and rover on the far side of the moon in new images, as the Chinese robots explore the floor of Von Kármán crater. LRO took a series of photos of Chang’e 4 from different viewing angles, and the most detailed view was captured Feb. 1 as the orbiter sailed overhead at an altitude of around 51 miles (82 kilometers), according to an update written by Mark Robinson, principal investigator for the Lunar Reconnaissance Orbiter Camera, or LROC, at Arizona State University. Chang’e 4 landed on the moon Jan. 3, braking to a soft touchdown on the floor of Von Kármán crater, a 110-mile-wide (180-kilometer) crater in the southern hemisphere on the far side of the moon. The Chinese lander became the first spacecraft to achieve a controlled landing on the lunar far side, which never faces Earth. A dedicated communications satellite launched by China last year relays signals between Earth and Chang’e 4. The Chang’e 4 mission includes a stationary lander and mobile rover, each carrying cameras and scientific instruments. The two vehicles were built as spares for China’s Chang’e 3 mission, which was the first Chinese lunar lander, touching down on the near side of the moon in December 2013. Chinese officials repurposed Chang’e 4 with new scientific instruments and sent it to the far side of the moon. 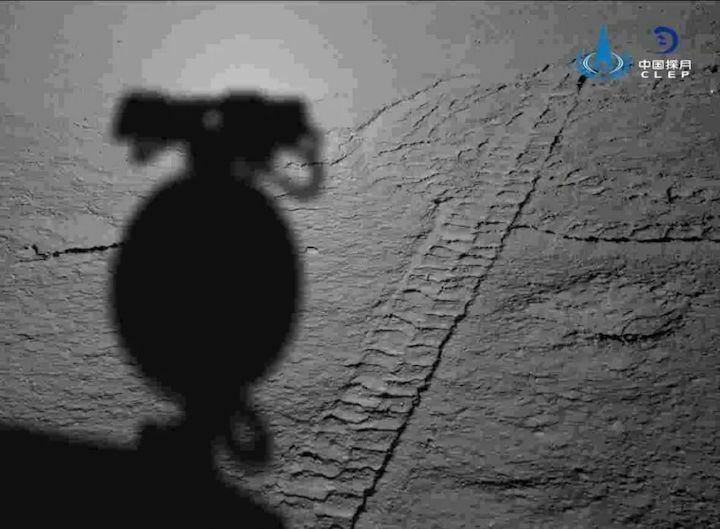 In the Feb. 1 image from LRO, the Yutu 2 rover is visible around 95 feet (29 meters) from the Chang’e 4 lander. A previous LRO image captured Jan. 30 showed the Chang’e 4 lander from a more oblique view, providing spectacular context on the craft’s location in Von Kármán crater, itself marked with numerous smaller craters created by subsequent asteroid impacts. The far side of the moon has a much different appearance than the side facing Earth. The far side has more craters and is more rugged, and Chang’e 4 is exploring a site in Von Kármán crater that was filled with basaltic lava excavated from a nearby crater. “Chang’e 4 will collect compositional measurements of these far side basaltic rocks, and lunar scientists are anxiously awaiting these results. Do volcanic rocks on the far side differ from the basalts collected from the near side? We will have to wait and see!” Robinson wrote in a Feb. 8 blog post. Approaching its 10th anniversary in lunar orbit, LRO has surveyed the moon’s landscapes and searched for evidence of water ice, finding signs of cold pockets where frost might be present near the lunar south pole. 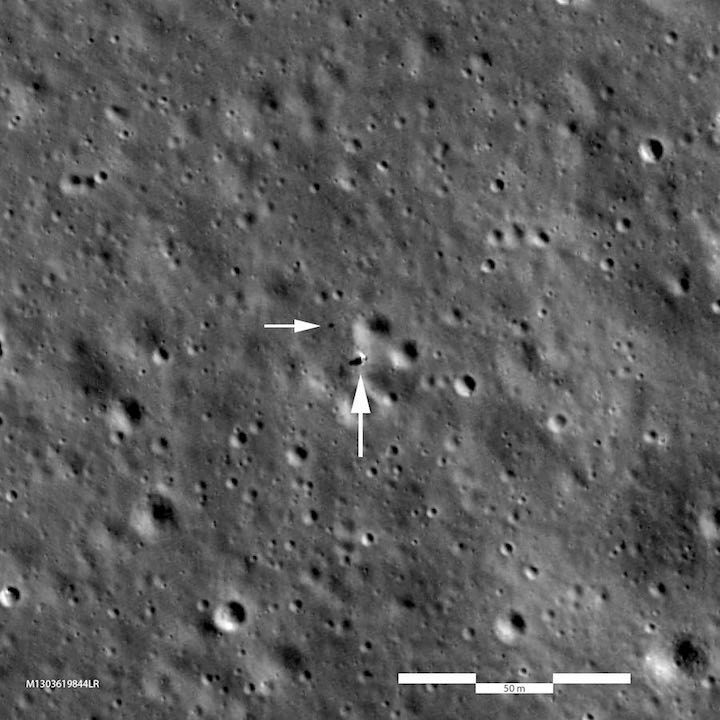 Throughout its mission, LRO’s high-resolution mapping camera has snapped pictures of the Apollo lunar landing sites, and spotted China’s Chang’e 3 and Chang’e 4 robotic probes on the surface after their landings. Chang’e 4’s Yutu 2 rover has accumulated nearly 400 feet (120 meters) of driving, eclipsing the movement accomplished by Chang’e 3’s rover in late 2013 and early 2014 before it lost mobility. Chinese officials said the rover and lander went into hibernation Feb. 11 for the mission’s second lunar night since landing, with wakeup planned Feb. 28 and March 1, respectively, to resume their scientific observations. China will gradually open data collected by the Chang'e-4 lunar probe to the world, the country's lunar program chief designer said. China's lunar rover has conducted scientific detection on some stones on the far side of the moon, which might help scientists find out whether they are from outer space or native to the moon. The rover Yutu-2, or Jade Rabbit-2, was sent to the Von Karman Crater in the South Pole-Aitken (SPA) Basin on the far side of the moon on Jan. 3 in the Chang'e-4 mission. Currently, the rover has traveled about 127 meters on the moon, and is taking a "noon break" as the temperature on the moon rises extremely high. It's scheduled to resume work on March 10 and switch to its dormant mode on March 13, according to the Lunar Exploration and Space Program Center of the China National Space Administration. Scientists said the rover has conducted scientific detection on its tracks and nearby stones. The largest stone detected has a diameter of about 20 cm, and the rover came as close as 1.2 meters to it. Experts from the National Space Science Center (NSSC) under the Chinese Academy of Sciences (CAS) said they want to figure out the origin of the stones, whether they are aboriginal on the moon, or meteorites from outer space. If they are aboriginal, what is the physical process of their formation? Ping Jinsong, a researcher with the National Astronomical Observatories under CAS, said that the rocks on the lunar surface might be sputtered body as a result of the meteorite impact. Scientists have found evidence indicating a heavy asteroid bombardment event in the solar system around 3.9 billion years ago. And the SPA Basin might be an impact from that period. The exploration might offer clues as to why the bombardment occurred, said Zou Yongliao, director of the lunar and deep space exploration division of CAS. The other possibility is that the stones are aboriginal, and contain geological information different from the lunar dust, said Ping. From the images sent back from Chang'e-4, scientists found the area surrounding the probe is dotted with craters of different sizes, and it's very difficult for the rover to drive in the region. The rover is capable of avoiding some obstacles. If there are obstacles in front of it, it can stop and plan a new route on its own. It can also climb some slopes and cross rocky terrain, according to its designers from the China Academy of Space Technology. The rover has sent back pictures about the stones on the far side of the moon. Experts from NSSC said it's not easy for the rover to take the pictures since it cannot move as freely as a human. It takes a long time to move and adjust the position and angle of the rover. Scientists hope Jade Rabbit-2 will travel farther to send more images of the unknown terrain, "listen" to the stories recorded in the ancient lunar rocks, and find more traces of the early history of the moon and the solar system. Scientists said it's just the beginning of the scientific journey of the Jade Rabbit-2, and they expect more interesting discoveries. The moon has traditionally been associated with women, maybe because the menstrual cycle is roughly the length of the waxing and waning lunar cycle. Now China's lunar exploration program, named after the moon goddess Chang'e, is highlighting the contributions of female scientists and engineers. In Chinese legend, Chang'e flew to the moon and became a goddess, but could never return to Earth to reunite with her husband. She would have envied a young couple in the research team that developed the Chang'e-4 probe, which made the first ever soft landing on the far side of the moon this year. Qi Tianle married her beau, Ma Qianli, on Sept. 9, 2018, after dating for about 10 years. On their wedding night, they packed for a special three-month "honeymoon". The next day, they set off to Xichang Satellite Launch Center, in the mountains of southwest China' Sichuan Province, to prepare for the launch of Chang'e-4. Classmates in school, they had both gone to work in the China Academy of Space Technology (CAST) after graduating from university in 2013, and joined the Chang'e-4 team in 2017. They chose the date of their wedding a year earlier, but later found it coincided with transport of the probe to the launch center. Their colleagues didn't want their wedding delayed, and asked them to go to the launch center after the ceremony. Just two days after they took their marriage vows, they made a pledge to complete the mission successfully before the national flag at the launch center. Although they spent most of the "honeymoon" in front of computers preparing for the launch, they enjoyed taking walks in the moonlight after supper. "We are happy to see Chang'e-4 carry our hopes to visit the moon," said Qi. Zhang Yuhua, a space engineer with the Shanghai Academy of Spaceflight Technology and deputy chief designer of the Chang'e-4 probe, had been part of China's manned space project for 18 years before she joined the lunar exploration team in 2006. Making a lab simulation of the running of the rover on the moon was one of the big difficulties. The researchers got volcanic ash from northeast China's Jilin Province to simulate the lunar soil. When the rover moved on the ash, it raised dust, causing irritation if inhaled or rubbed on the skin. To avoid dust, the lab air conditioner was turned off in the summer. The indoor temperature was over 40 degrees centigrade. Zhang and her colleagues wore masks, raincoats and rain-shoes to do the experiments, and were drenched in sweat. After China's first lunar rover, named Yutu, or Jade Rabbit, landed on the moon during the Chang'e-3 mission at the end of 2013, Zhang went to work every day as the moon rose. However, Yutu suddenly stopped moving after going about 114 meters on the moon. In the bid to revive it, Zhang felt great stress, and suffered ulcers in her mouth and a hoarse voice. "I was thinking if China could send people to the moon at that time, I would like to be the first to go. I wanted to repair our Jade Rabbit so much," Zhang recalled. All their efforts failed. Avoiding the same problem again became the challenge facing the team when they developed the new rover for the Chang'e-4 mission. "We cared for Jade Rabbit like our own child. I thought it was like a silver swan standing on the desolate moon, more beautiful than anything else," said Zhang. "Now, our second rover, Jade Rabbit-2, has landed on the far side of the moon. We hope it will realize our dream," she said. "I have never doubted the significance of my work. I believe humans will go much further into the universe in the next 100 years. But life is too short, and I can only do my best," Zhang said. Zhang He, 48, executive director of the Chang'e-4 probe project from CAST, believes the women in her design team have a stronger sense of responsibility and self-esteem than many men, and are more meticulous and better at communicating. Zhang had read the book, Lean In, by Sheryl Sandberg, chief operating officer of Facebook, which encouraged women to show their talents in work. Like the author, she often found herself the only woman at meetings. "I respect and envy full-time mothers. This is a personal choice. We have to accept what we have chosen, both the gains and losses," Zhang said. She took her son to gaze at the stars when he was very young. Now her son is 12, and loves mathematics and astronomy. "I don't have much time with him each day, but we are very close. My son can see my endeavors to chase my dream and is influenced by me," Zhang said. Her husband was a classmate in university. He disagreed with those who said Chinese people lack creativity and innovation. "My wife is a space engineer. I saw how she worked hard to send spacecraft to the moon." "I can feel the understanding and support of my family in my work," said Zhang. Lunar exploration has made her braver and more confident. "When we began to develop the Chang'e-3 probe, the noise generated by the variable thrust engine was terrifying. But I grew used to it," she said. "We encountered a lot of technical difficulties in developing the lunar probe, but we overcame all of them. They were like problems in life, and were solved eventually." A career in space exploration also changed the lives of Zhang's family. On vacation, Zhang asks her husband to make a very detailed plan to consider all possible scenarios. This makes the journey more relaxed. Zhang and her team like to call China's four lunar probes the "four sisters." "I believe, Chang'e-4, the little sister, will be braver, smarter and stronger than her elder sister, Chang'e-3, and perform excellently," Zhang said. HELSINKI — The Chang’e-4 lander and Yutu-2 have powered down for a third lunar nighttime on the far side of the moon, with the rover reaching its design lifetime. 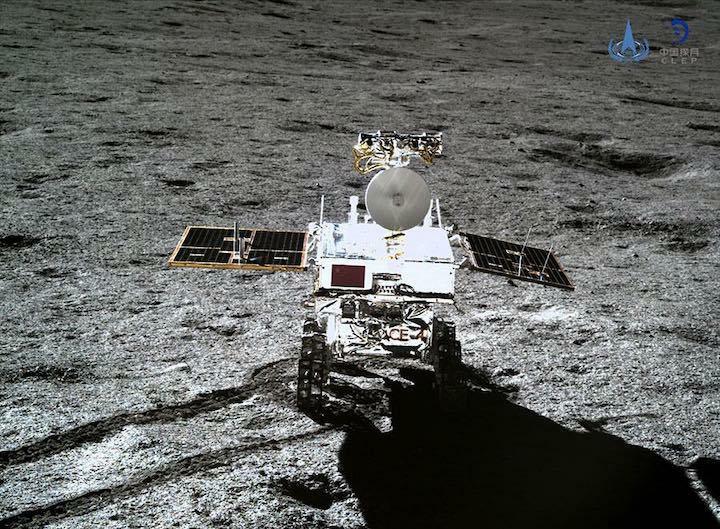 The 140-kilogram Yutu-2 rover entered a sleep state at 12:16 a.m. Eastern Wednesday, according to the China Lunar Exploration Program (CLEP), having reached a total drive distance of 163 meters across three lunar days in Von Kármán crater. Yutu-2 has now reached its design lifetime of three months, having been deployed onto the surface of the moon shortly after the Chang’e-4 lunar far side landing on Jan. 2. The first Yutu rover, which set down on Mare Imbrium on the near side of the moon as part of the Chang’e-3 mission launched in December 2013, managed to rove just 114 meters before a short circuit during its second lunar day left it unable to move. The rover continued to function while stationary until mid-2016. With all systems and payloads operating well, the Yutu-2 team will continue roving and science data collection on lunar day 4 of the Chang’e-4 mission, according to a CLEP announcement (link in Chinese). Yutu-2 added 43 meters to its overall drive distance in its third day of activities, continuing a path to the northwest of the landing site, which was recently named ‘Statio Tianhe’ by the International Astronomical Union. The rover just covered seven meters between waking for lunar day 3 on Feb. 28 and Mar. 3, during which time it navigated carefully toward a 20 centimeter diameter rock in order to analyze the specimen with an infrared and visible light spectrometer to determine its origin. Yutu-2 then powered down between Mar. 3 and Mar. 10 as a precaution against potential issues related to high direct solar radiation, such as overheating, with the sun high in the sky over the landing site in the 115-mile-wide (186 kilometers) Von Kármán crater within the South Pole-Aitken Basin. The Chang’e-4 lander likewise entered dormant status a few minutes ahead of the rover. Both spacecraft are expected to resume activities sometime after sunrise over the landing site late Mar. 28. During the first lunar night the lander returned data indicating the temperature had plummeted to minus 190 Celsius (minus 310 Fahrenheit). Both spacecraft close solar arrays and are protected by radioisotope heater units. As the far side of the moon never faces the Earth, communication and data transmission between ground stations and the Chang’e-4 spacecraft has been facilitated by a relay satellite stationed in a halo orbit around the second Earth-moon Lagrange point. The Queqiao (‘Magpie bridge’) satellite earlier this month turned on a low frequency astronomy payload, the Netherlands-China Low-Frequency Explorer, for the first time. NCLE will gradually deploy its three five-meter-long antennae to make observations of the solar system and, potentially, signals from the cosmic ‘dark ages’. A laser ranging test involving an observatory in the southern Chinese province of Yunnan is expected to be carried out in March, targeting a laser retroreflector aboard the Queqiao satellite. China's lunar program released this image of Yutu 2's tire tracks on the moon on March 30, 2019. It's back to work for China's moon mission: The Chang'e 4 lander and the Yutu 2rover both awoke over the weekend to start their fourth lunar day. Both robots went to sleep on March 13 to wait out the long, frigid lunar night, which lasts for about two Earth weeks. That dormancy marked the third night for the mission, which touched down on the moon's surface on Jan. 2. 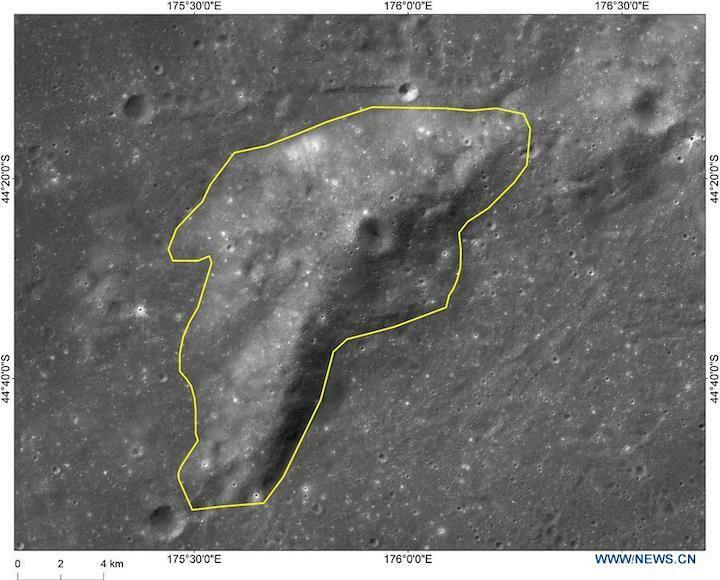 As of the end of its third lunar day, Yutu 2 had traveled a total of 535 feet (163 meters) on the moon's surface around Von Kármán Crater on the far side. 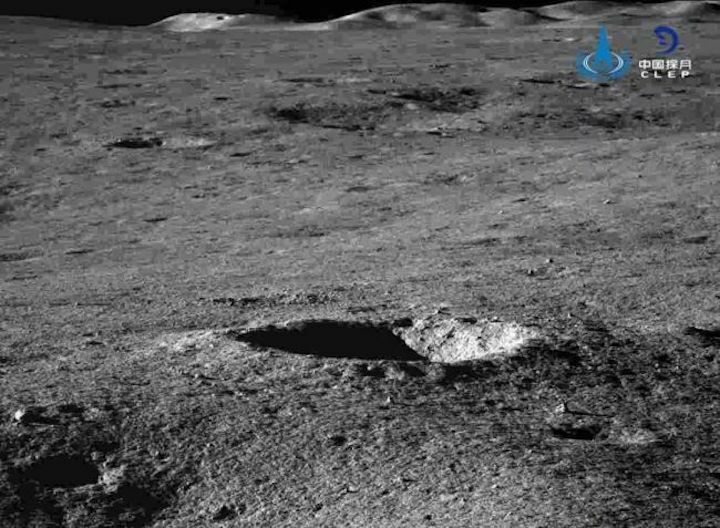 China's lunar program released this image of the far side of the moon on March 30, 2019. The China Lunar Exploration Program, which heads up the mission, has not provided any details about its scientific plans for the fourth day of Chang'e 4, which is focused on exploring the far side of the moon and how it differs from the near side.